Award season is upon us! And what a better way to kick it off than with the 69th Annual Golden Globe Awards - a who's who of the film and TV industry. Keep reading for a round up on nominees and winners, and find out who made it on our best dressed list! Now that the 'important'' stuff is aside, let's move onto the fun stuff - fashion! Here are our top ten best dressed celebrities. At Number Two, we have Shailene Woodley, actress in "The Secret Life of an American Teenager", who looks gorgeous in this strapless gown by Marchesa. She looks so graceful and the fit on her bust is perfect. The simple earrings and her hairstyle complete the look. Top points Shailene! What more can we say? 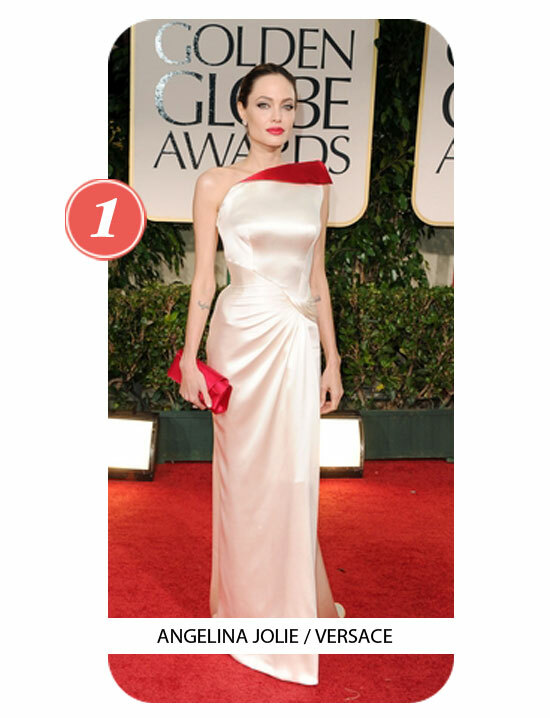 Angelina looksdemure in this white and red accented off the shoulder Versace gown. Refined and beautifully fitted - what a win! We'll be compiling our WORST dressed list tonight, so be sure to come back later for a look at this awards ghastly finds!